The 2019 Hyundai Santa Fe is the recipient of a bold new makeover. Not only does the exterior offer a more muscular look, the interior cabin space has been expanded to increase comfort. The Hyundai Santa Fe has been one of the brand's best-selling vehicles for good reason. 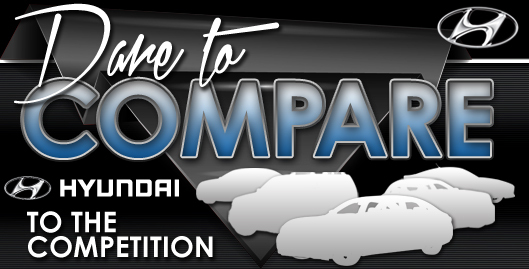 The 2019 model promises to make the vehicle more intriguing to other customers who may have overlooked the SUV in the past. 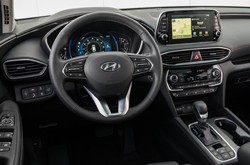 There are so many new features that you should check out, Here are a few other things that you should know about the 2019 Hyundai Santa Fe. This 5-passenger seat SUV has been redesigned with additional cabin space and upgraded technology. This vehicle offers two rows of seating. If you purchase the diesel Santa Fe, you'll have the option to get a third row. Here's another name change that you should know about. The three-row Santa Fe is now known as the Santa Fe XL. Although this trim model is part of the 2019 Santa Fe lineup, it hasn't been redesigned. New exterior design elements include recessed fog lamps and dramatic hood styling. New interior design elements include a sculptured dashboard and an upgraded infotainment system. Visit or contact Van Hyundai to learn more about the all-new 2019 Hyundai Santa Fe. Which Trims and Options are Available? 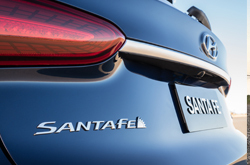 The 2019 Santa Fe is available in various trims. The SE trim model has Apple CarPlay, Android Auto and a 7-inch display. The SEL trim model features push button start, a 7-inch color LCD instrument cluster and an 8-way power driver seat. The SEL Plus offers rear occupant alert, a hands-free smart liftgate and dual automatic temperature control. The Limited model features a panoramic sunroof, leather seats and LED headlights. The Limited 2.0T model features LED fog lights, leather seating surfaces and a panoramic sunroof. The Ultimate model features a surround view monitor, heads-up display and an 8-inch touchscreen navigation system. The Ultimate 2.0T model features a wireless charging device and a surround view monitor. Exterior colors include Earthy Bronze, Rainforest, Lava Orange, Scarlet Red, Stormy Sea and Twilight black. Interior color combinations include black(beige), black(black) and Espresso(gray). How Powerful is the 2019 Santa Fe? The SE, SEL, SEL Plus, Limited and Ultimate have 185 horsepower@6000 RPM. The Limited 2.0T and Ultimate 2.0T have 235 horsepower@6000 RPM. Available engines are the inline 4-cylinder and inline 4-cylinder turbo engines. All trim models have a standard gasoline direct injection. 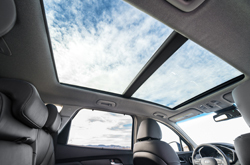 Standard safety features of the 2019 Hyundai Santa Fe include LATCH lower anchor and upper tether anchors, vehicle stability management, blind-spot collision avoidance, parking distance warning and tire pressure monitoring. An optional safety feature is downhill brake control. Call or visit us at Van Hyundai to see why this SUV is a worthy choice.